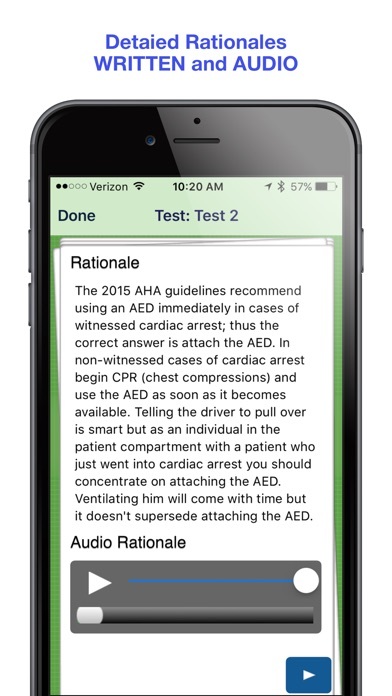 The free version of EMT PASS contains one 10-question sample examination with audio rationale answers as well as 7 introductory audios with test-taking tips and information on how to use the app. 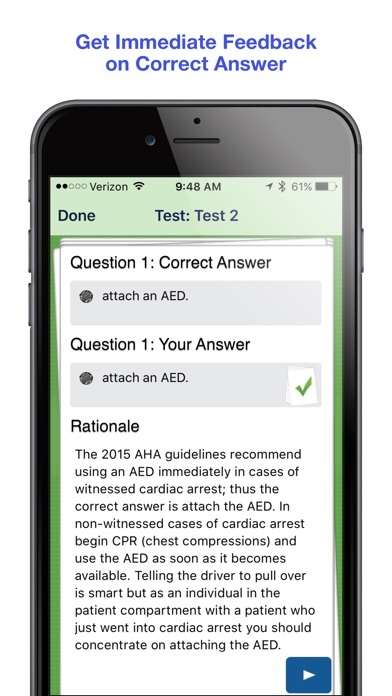 The full version of EMT PASS 2.0 (requires in-app purchase) is now enhanced with written rationales, newly revised audio rationales, and EMT PASS Predictive Scoring ™ to help you better prepare for your NREMT or state certification exam. The NREMT is a pass or fail exam – it is not about getting 100% of the questions correct- it is about proving you know the material. 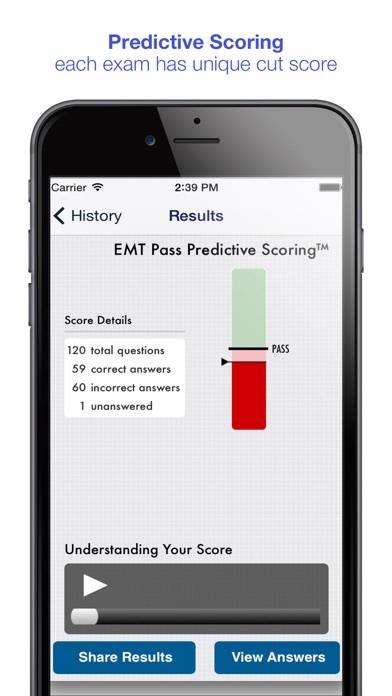 EMT PASS Predictive Scoring™ will show you if we predict you will pass or not based on your exam performance and whether you have demonstrated you have the required breadth of knowledge. The rationales have been revised to give you not only the answer, but provide you with information you need to be a better test taker and EMT. The rationales are mini 1-2 minute teaching lectures to help you learn to read a question, take apart the puzzle of a scenario or EMS call, and provide the needed pathophysiology knowledge at the EMT level. 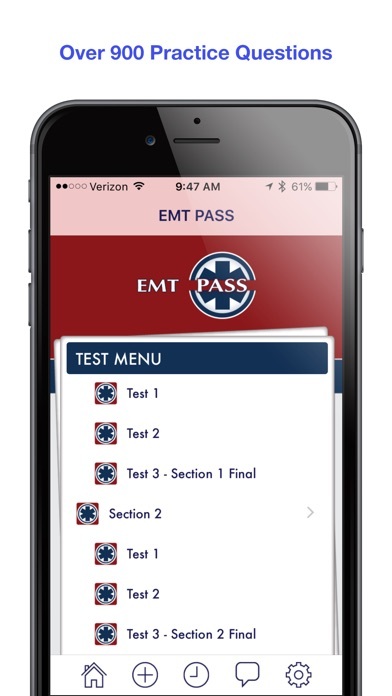 EMT PASS contains 960 challenging questions in 8 examinations and over 20 hours of audio recordings, EMT PASS™ is the single, high quality tool you need to pass the exam. The app is broken up into three sections. Section one covers the first half of the EMT knowledge base; the second half covers the remaining material. Section three contains two simulated final examinations. But our features don’t stop there: •Use EMT PASS™ at your desktop or on your phone or tablet by using the app or logging into http://LC-Ready.com with your account information. •7 mini-podcasts explain the exam and provide study advice and tactics. •Pause exams if you get a call or go into class. The program resumes where you left off when you are ready. •Each exam has a specific pass/fail cut score based on difficulty level. •You receive customized audio feedback on exams based on your performance. •High quality test questions and detailed audio rationales support users regardless of learning style or reading ability. EMT PASS™ is an exam preparation product like no other. What makes this product unique is the combination of high quality test questions and detailed audio rationales created by Bill Brown, former Executive Director of the NREMT. All exam items in EMT PASS™ are original work. This product is designed to closely simulate the NREMT exam but does not contain any actual NREMT exam items. Limmer Creative and Bill Brown both support and respect the NREMT and its mission. Definitely makes you think and what i really like is how the narrater or developer shows he wants you to pass and tries to push you. Cons: the only con i really have is it seemed as if sometimes the answer your lead to believe isnt the right answer based on previous questions. For example, one question talks about delivering a newborn and what to do next. Some say assist the shoulder, some say look for the nuchal chord following, others say start the nursing process. When you start throwing in a new “correct” answer with something you thought you knew it becomes confusing. Theres been more than a handful of questions i missed that i then made sure i remembered them only to be “wrong” a very similar question later and im left unsure as to why this was right then and why theres a better answer now? Most of these are also on final exams which you cannot read into why that choice was correct. There are definite pros and cons with this app and the way the information is presented. There are quite a few subjective questions within the tests and some that directly contradict concepts that were taught to me in my EMT training course. I did wonder when, at times, the last revision had been performed. I also happened to not be the biggest fan of Bill Brown’s approach to feedback. It can be abrasive and certainly is not conducive to creating a positive learning environment. However, he has had a successful career to date, so it got him somewhere and there is respect in that. At the end of the day, he isn’t directly judging you in the field or on your tests. Take his approach personally, or don’t— either way, some things just are what they are. It’s a good chance to learn to let things roll of your back or get you all jazzed up to the point you get thrown off your game. Adversity is good for you. Where this app stands out is that it is written similarly to how my NREMT was written, but different than how my classroom tests were written. There in lies the benefit. The app challenges you to think critically and differently about how you approach scenarios and other aspects of this job. I won’t say I always agreed, but it forced me to consider other options and exhaust my resources in finding answers and alternatives so that I could be better prepared for the unpredictability of being an EMT. I had a class discount for the app, and I found it worth the amount I paid because of this reason. Sure it will challenge you— I failed every practice tests, yet performed highly in class and on the NREMT. So thank goodness Limmer Creative isn’t issuing my certs or signing my paychecks. However, the app made me work a bit harder and hold myself more accountable than I’d have done on my own. And for that I’d happily recommend it for anybody seeking to continue to grind today to be better prepared for tomorrow. I purchased this app and an app called “emt pocket prep” and as a recent emt school graduate passed the nremt on my first try. Would recommend. Ok, this app is tough....way beyond the average knowledge of a new EMT. However, if you go through the tests and listen to the feedback the NREMT Exam will be easy. Yes, Easy. The narratives explain the answers with solid scientific reasoning. However, don’t expect kind words for your choices. The narrators aren’t your typical feel good instructors of today...they tell it in black and white English. So be prepared. Remember, these are tough questions that make you think. They force you to apply the knowledge you’ve learned. Thankfully I passed my exam on the first go....it cut off shortly after 52 questions. So yes, I’d recommend the app to anyone looking to expand their EMT knowledge as well as pass the test. Originally got the app after trying the ten sample questions and thought, “hey this might be a good app to prepare me based on the difficulty”. I’d rather be over-prepared than under-prepared and I’d like to believe this app helped me with that, but it’s questionable. The creators have a vast knowledge and are pretty significant individuals in relation to the NREMT, but, they are poor in delivering their knowledge. I paid $30 for a quality app and got a sub-par few tests. First off, the narrator makes you feel like crap, saying if you missed this question you should question yourself in your career pursuit. I understand this is maybe a good wake up call for some, but after failing the NREMT once, I don’t need opinionated bull**** for $30. It’s pathetic. Then in the app, on tests, you don’t receive any rationale for any of the questions after you submit the test. How are you supposed to know why you got a question wrong? Also, the audio rationales for the pretests are as if they used a phone microphone trying to put out an app as soon as possible. Overall, it had potential but it’s definitely not worth $30, maybe $15 at most. If you want to blow $30 on an okay app to study, go for it. This app really helped out a lot. I read and studied the book, passed the class and was still scoring low on this app because I would second guess myself. The written rationals are good but the audio rationals that expand on them are even better. Bill really makes you think beyond just memorizing facts.The questions are challenging but helped improve my critical thinking skills. Bill is tough but fair and I found his commentary fun, (although I was in the military so I don’t take it to heart because it’s part of the motivation process) if your focusing on your feelings and not the material, then what are you doing? “Did you even read the book?” Side note: I passed the NREMT first try, this app made it seem too easy! Awful doesnt even look like the NREMT exam. Don’t recommend it.. and the narrator is a jerk. There is even a question where the answer is “perform a 12 lead” thats not a national standard thats more of a local protocol.. Anyways it does go way above standards but if you looking to kill your confidence before taking the exam well then this is the all for you lol. I failed the NREMT on my first try and got this app a week before my next attempt and passed it, highly recommend it.